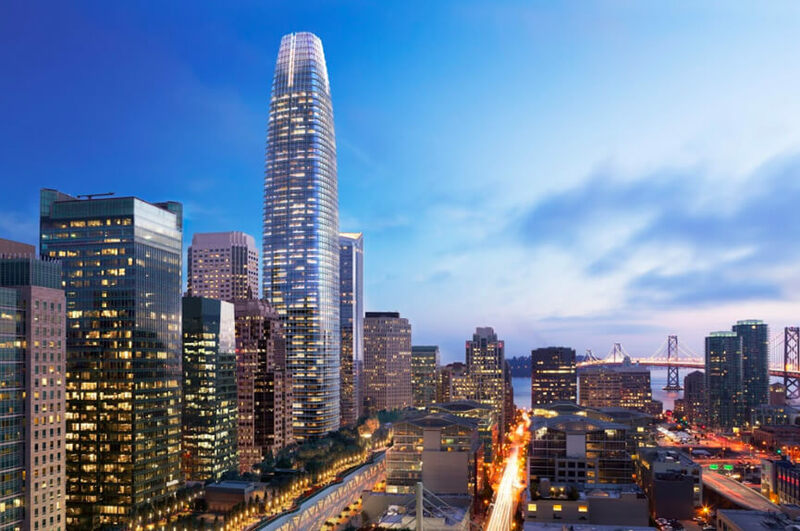 In 2013, construction began on the Salesforce Tower which at completion stands 1,070 feet in height, the tallest on the San Francisco skyline. The building was constructed by a joint venture between general contractors Clark Construction and Hathaway Dinwiddie. BKF Engineers was selected to perform construction survey, and alignment for the corewall – – a construction technique that drastically accelerates construction time. Concrete surfaces exposed to the sun will expand when compared to those on the opposite side of the building. This will result in the building moving “away” from the sun. Considering that control for concrete formwork needs to be set during the day when solar effects will be at a maximum, this can be a very challenging problem for survey crews to manage throughout their daily tasks. Building resonance induces movement in the tower with periods of as little as 10 seconds up to 15 minutes. Additionally, wind drag, and crane loads induce random movements with periods of 5 to 15 minutes. These compounded dynamic effects cause the building to move from the theoretical vertical axis and oscillate about an offset position. An successful survey program has to be designed to tolerate this movement and allow construction to proceed in a continuation of the alignment of the previous levels regardless of these dynamic effects. Uneven Settlement manifests as the load on the foundation increases. If the settlement is uneven this will cause a corresponding tilt in the tower structure. Construction Sequence can also cause the center of mass of the building to move causing a corresponding movement in the structure. Safety – the foundation on which the tower was to be built rest on a landfill near the original San Francisco Bay waterfront; an area prone to soil liquefaction during earthquakes. The tower needed to be strong enough to withstand the conserable seismic activity present in the area. Construction Timeline – Developers secured their first major tenant lease, Salesforce, in 2014. Occupying 714,000 square feet, they would be the anchor tenant of the building. As such, maintaining a strict construction timeline was imperative. In order to mitigate deflection effects, and address the concerns above, BKF Engineers implemented an optimized core wall surveying system to accelerate construction timeline, as it automates control transfer from ground to the working level. This optimization drastically reduces survey setup times each day and improves the accuracy of control and layout at elevations above 40 stories. BKF Engineers optimized high-rise survey system consisted of Leica GNSS sensors, embedded Geokon strain gauges, and sensemetrics cloud connected THREAD devices. This cloud connected system facilitated sensor automation and streaming of real-time coordinates and sensor data to to BKF field crews on their mobile devices. Despite all of challenges of precisely aligning a high-rise as it experiences such a broad range of structural movements, BKF’s chosen technology solution from sensemetrics and Leica Geosystems allowed the construction process to proceed on schedule and to tolerance. It also provided real-time survey control for project surveyors and trades layout crews to precisely position components at the working level without the need to tie to external control points off structure, greatly increasing the productivity of all survey processes at elevation. sensemetrics was chosen as a premiere technology provider for high-rise construction survey because of its cloud based data delivery platform, and plug&play support for sensors and technologies from its partners Leica Geosystems and Geokon, Inc – leaders in sensing solutions for spatial and structural applications. In addition to the optimized survey setup times and its dramatic impact on construction progress, BKF also realized a cost savings of approximately 25%.